Experienced in exporting custom homes & structural steel building solutions throughout the Pacific. There are Ezy Homes in PNG, Fiji, Nauru, Vanuatu, Timor Leste & The Cocos Keeling Islands. 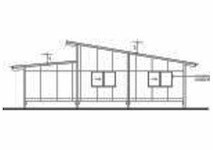 Our style of elevated pole home construction is ideal for tropical climates, allowing cool breezes to flow under the home – and has proven itself to be fast & easy for local workers to construct. Ezy Homes have stood the test of time, including cyclones & earthquakes. From frame only homes through to full turn key materials, packed into shipping containers – Ezy Homes can provide a custom design and inclusions package to suit your project needs. Whether you require 1 home or are planning a major development, Ezy Homes can help. Ezy Homes handles the shipping process, for you to collect at the port of your choice. The total cost to pack and ship a 40′ container is around AU$6,500 to PNG & Fiji. Goods supplied are unassembled “building materials” – not a prefabricated home classification. Import tariffs generally range from 0% to 15% depending on the product type & country. Goods supplied to Fiji incur a flat rate 5% import duty and 9% VAT. All goods & services supplied for export exclude Australian GST, however local GST or VAT may apply. Please confirm current import tariffs with a local customs agent. Our structural frame is very easy to assemble. All components are clearly labeled and the house frame simply bolts together. Frame erection and on-site training is available for larger projects (subject to local visa requirements). In under a week we can to demonstrate erecting the columns, building the floor structure, laying the floor, building & sheeting the roof – ready for wall frames. Beyond structural frame erection stage, the building requires standard carpentry and trades like electrician, plumber & plasterer are required to complete the home. The Pacific 64 has 2 bedrooms, open plan living & an optional 12m2 balcony. The home can be elevated for storage or extra rooms below. The Pacific 67 has 2 bedrooms & a 9m2 covered balcony. The home can be elevated for storage or extra rooms below. 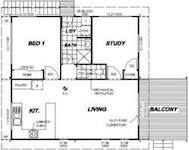 The Pacific 90 has 3 bedrooms, 2 bathrooms & open plan living, all in a 90m2 footprint. The home can be elevated for storage or extra rooms below. The Pacific 3-150 has 3 large bedrooms, open plan living & 32m2 covered balcony. The home can be elevated for storage or extra rooms below. 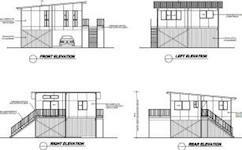 Note: All of our standard homes can be exported, as well as custom designs. 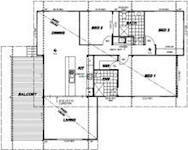 Below are example home plans and export pricing options. Note: All export pricing excludes GST. 1, 2 & 3 bedroom executive level homes, designed & supplied by Ezy Homes. Constructed by local workers following a week of onsite training. Ezy Homes drafted & developed plans with the client, then prepared full working drawings for the project – all structurally certified for approval by the local building authority.